And featured image to your portfolio item. IMPORTANT! You must add a Featured Image to your portfolio item. The featured image is the thing that displays in the portfolio section of your web page. When you have six portfolio items, you can move on to the next step. 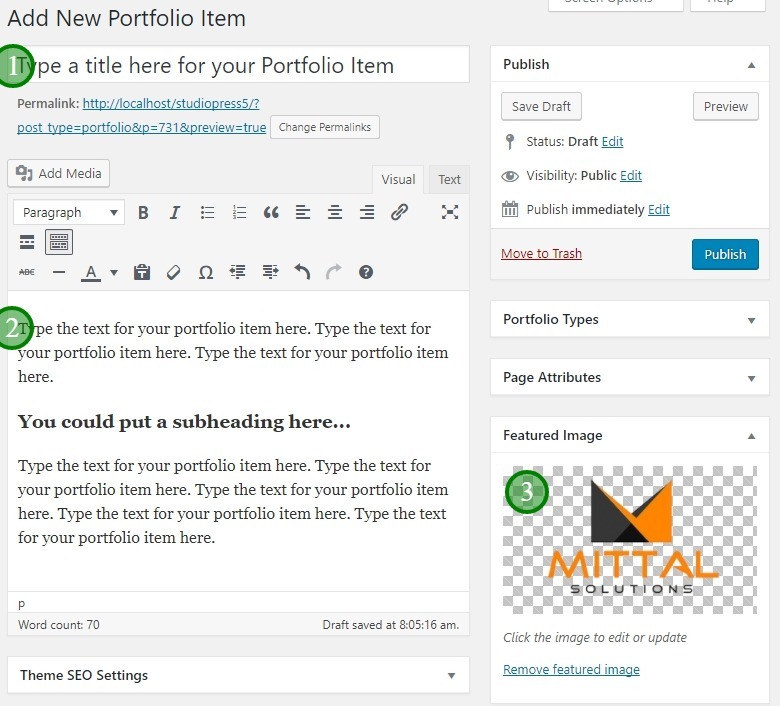 Drag a Text widget in to the Home-Portfolio widget area. Type a title for this portfolio section. Paste the shortcode into the text widget. If you want to you can type an introductory paragraph above the shortcode. Drag a text widget into the Home-Portfolio widget area of Hello Pro. Then type a title and paste the shortcode into the text widget. You can type a short introductory paragraph above the shortcode if you wish. The shortcode will automatically draw in six portfolio items.